North Central Florida experiences increasingly longer periods of sunlight as we roll through spring and into summer, peaking at around 14 hours of full daylight in mid-June. Given our area’s amazing selection of outdoor actives, many of us will likely spend a good deal of time in the sun in coming months. 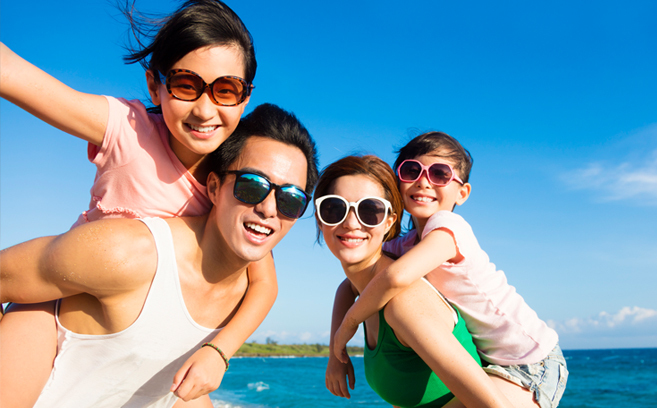 Before heading outside, it’s important to take precautions to protect your eyes from the sun’s harmful rays. The sun produces two forms of ultraviolet (UV) radiation that can be harmful to our eyes: UV-A and UV-B. Long-term effects of too much exposure to these UV rays can include retina damage and increased risk of cataracts. In the short-term, you can even experience photokeratitis, which is essentially a sunburn on the eyes. are perfectly matched in color and free of distortion and imperfection. If you wear prescription eyeglasses, it’s a smart decision to also get a pair of prescription sunglasses. After all, you don’t want to sacrifice the quality of your vision while you’re enjoying the outdoors. A talented optician can provide you a set of sunglass lenses that will protect your eyes while helping you see clearly. They can also help you select frames that look great and work with your lifestyle. North Florida Cataract Specialists and Vision Care offers optical services at both our Gainesville locations: NW 8th Avenue and Tioga Town Center. Both optical shops feature hundred of designer frames from brands like Tag Heuer, Kate Spade, Costa del Mar and Etnia Barcelona, among others. Our expert staff is eager to answer any questions and to help you select the perfect pair. Contact us today to schedule an appointment. Walk-ins are also welcome.